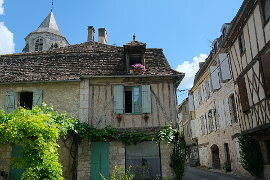 Eymet is in the Perigord Purple region of south-west Dordogne, about 20 km south of Bergerac. Eymet is an attractive town to visit, with a thriving central market square and an attractive location on the banks of the Dropt river. 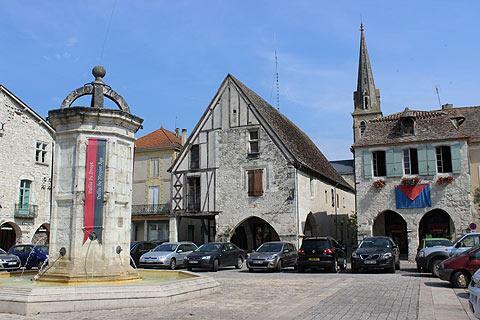 The town in its current form dates from 1270 (founded by Alphonse de Poitiers), although the same location has been occupied during the earlier Roman and prehistoric eras. Eymet has a typical bastide town layout (bastide towns are found more commonly in the Lot-et-Garonne and other departments to the south of the dordogne). This layout includes an open square which originally held a market hall (this no longer exists in Eymet), with straight roads leading off the square, lined with medieval houses. 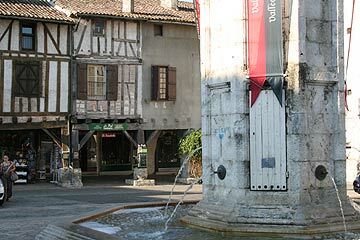 The houses around the edges of the central square in a bastide town are typically arcaded, as in Eymet, with stone pillars supporting the upper storey, which can be in either stone or colombage. The houses date from the 13 to 15th century. In the centre of the square there is a large fountain. More unusually among these towns, Eymet has also retained some parts of its defensive walls, castle, and an attractive bridge over the river. 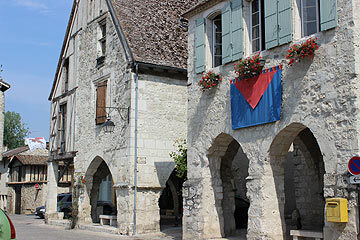 Eymet, like most of the bastides began life as a trading and agricultural centre. Building these towns allowed the rich fertile land to be farmed and artisans of other trades moved in to trade with the farmers. Political and economic guarantees were awarded the towns to persuade people to move into them. As the area fell once again to war many of the bastides were fortified and in Eymet defensive walls were built. The castle in Eymet was built in the 13th century. It has a donjon (keep) which was built at the same time and defensive walls which were built some years later. There is also a circular tower which permitted communication with the donjon. Eymet has a lively market every Thursday morning and in July and August it has an extra market on a Sunday morning. Every year on the 15th August there is a tasting of white wine and oysters in Eymet's main square - delicious. Eymet is very well served for restaurants and cafés and as it sits on the edge of the river Dropt it offers some lovely spots for a picnic too. There are a few small places of note in the vineyard covered region south-west of Bergerac / north-west of Eymet, including the little villages of Sigoulès, Pomport and Saussignac. 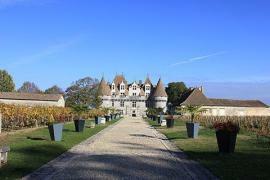 If you are a wine enthusiast try visiting some of the wine chateaux. Many are open for visits and tasting. The Chateau de Tiregand offers a visit around the vineyard too. 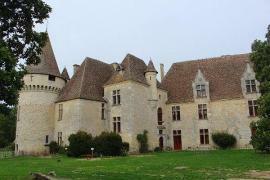 The Chateau de Monbazillac is a wonderful chateau as well as a wine producer. Issigeac is a beautiful medieval village close to Eymet. There are a number of very nice walks in the area - ask in the tourist office for maps.